After pedalling furiously across London from 100% design, it was a relief to have a rest in the beautiful handcrafted Scapa rocking chair from Pengelly Design. The chair, designed by Simon Pengelly, combines a contemporary wooden frame with a traditional technique of weaving oat straw into chair backs. Pengelly Design are collaborating with Jackie, pictured adding the finishing touches to a chair, and Marlene Miller of Scapa Crafts in the Orkney Isles to produce the chair in oak, ash or painted frames. Rested, I took in the rest of the show that was filling with after work crowds. First stop, Melin Tregwynt where their new colour ways, Knot Garden Indigo and Knot Garden Bluestone were on display, as well as a new range of bags made by Brady of Birmingham in the Melin Tregwynt fabrics. Upstairs, I found a contrasting selection of woollens woven in Wales from Eleanor Pritchard. Eleanor Pritchard’s aesthetic is influenced by English mid-century design, characterised by bold geometric and graphic reversible patterns, fused with traditional British textile crafts. Designed in London, fabrics are woven in 100% pure new wool at a small traditional mill in South West Wales. Luxurious woollen drapes, offset by shimmering wallpapers caught my eye at Rapture & Wright. 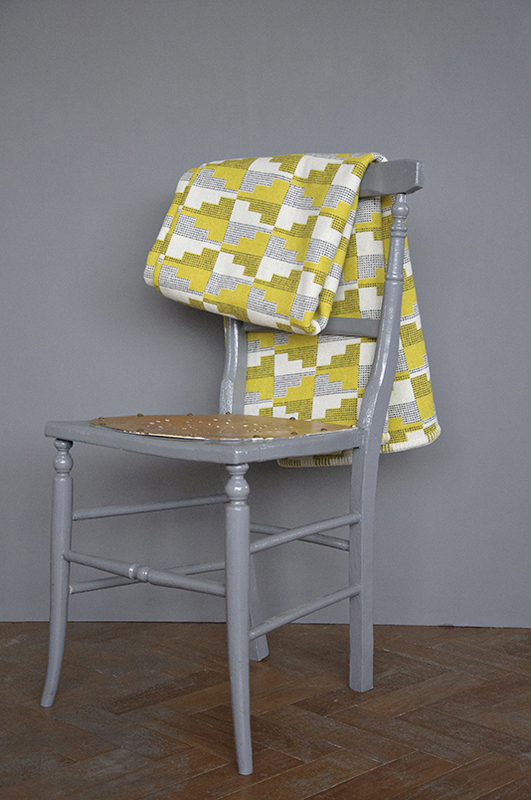 Their distinctive, contemporary graphic fabrics and wallpapers are handprinted in their Gloucestershire studio. And then it was on to investigate the commotion at the recraft station. [re]design were launching their new Make-It-Yourself book which contains step-by-step instructions for more than twenty designs made from domestic rubbish. In contrast to many products we consume, the hand-crafted accessories for the home made by Turner and Harper are built to last. They make simple things for everyday living with care and quality. My last stop of the day, was Granorte‘s fantastic selection of cork pendant lamps, stools, bowls and even bird boxes made from waste cork from wine stopper producers. The cork wall panels created a geometric sculpture on the wall cast striking shadows, as well as providing acoustic and thermal insulation. The stacking stool was comfortable, and as with all the products, they have a striking simplicity. Cork has featured heavily in my LDF experience, and I wondered whether it would feature on my final trip to Tent London.